While the fear of being kidnapped may persist for one’s entire life, in 2018 the number of missing persons under the age of 21 was much higher than those 21 and over, with 239,847 females under 21 reported missing, and 62,371 females over the age of 21 reported missing. There are many reasons why people go missing; some are kidnapped, some purposefully go missing - in order to escape abuse, for example - and some, usually children, are runaways. What persists in the imagination when thinking of missing persons, however, are kidnapping victims, usually due to extensive media coverage of child kidnappings by the media. 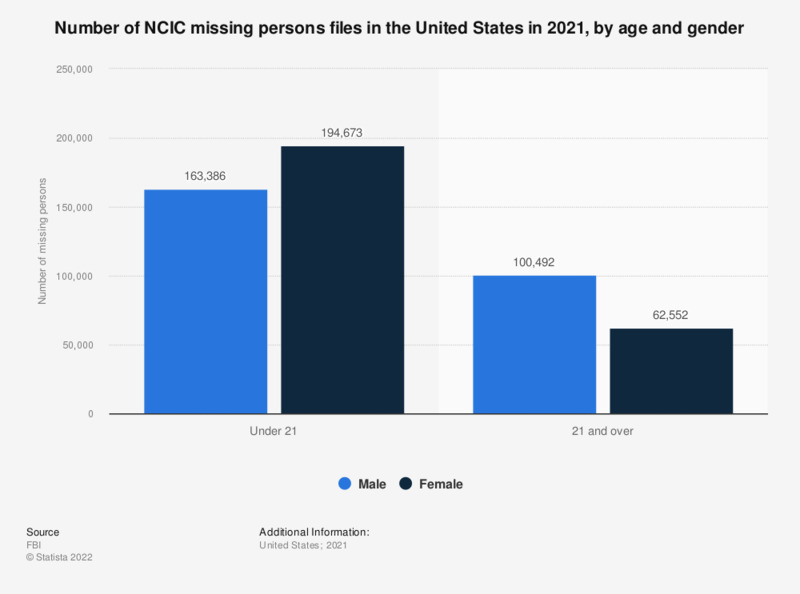 While the number of missing persons in the United States fluctuates, in 2018, this number was at its lowest since 1990. Additionally, while it has been observed that there is more media coverage in the United States of white missing persons, almost half of the missing persons cases in 2018 were of minorities.